Here are 2x Booths Edwardian Silicon China matching lidded vegetable tureens. They are marked on the base Booths Silicon China Date 1906 . The pattern shows garlands of pink roses with green leaves on a white background with gilt edging. Beautifully finished in the attractive & ever popular 'Real Old Willow' pattern. Booths Real Old Willow Blue and White with Gold Tureen. There is a chip on one edge with I've highlighted in the photos. If it's turned to the back you can't see it! Apart from this it's in good condition. Floradora design border with flowers in pink, blue and yellow, with green foliage and teal scrolls. Printed underneath in green with a lion and a crown symbol and: ROYAL DOULTON ENGLAND MADE IN ENGLAND FINE CHINA c. ROYAL DOULTON TABLEWARE LTD 1981. Booths was a well known and highly respected manufacturer of quality porcelains. 'Old Willow' was probably their best known range. (Poole Pottery Twintone Mushroom / Sepia Dinner Plates x 4 (#201614890509) £15.99 View Item. ) During past month. Spode Flemish Green Scroll Pattern Dinner Plates x 5 (#201594928433) £23.99 View Item. Used condition. Booths Silicon China "Embassy" c. 1910. Tureen LID ONLY. 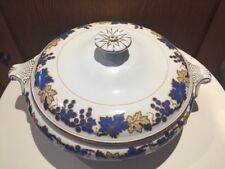 Tureen LID ONLY. Antique Booths Silicon China "Embassy" Pattern. Desirable Collectables. Booths lidded tureen. Blue and white with gold detail. Sorry no collection. they often have signs of wear and tear especially if they were for practical use & used daily or often. & may have been through 1 or 2 World Wars. Booths Green Dragon Lidded Tureen. Dispatched with Hermes Tracked. Booths Footed Tureen with Lid. with Blue Grape Vine Design. Made by Booths in Silicon China and decorated with a pretty pattern of pink 'Dog Rose' type flowers. Rd No. 724275. Lidded Tureen. Tureen Lid Finial has been reattached. with cut-out for Ladle. Incised date of 1928 to base. 7" tall (17.5cm) incl lid & stand. Hand Painted Pattern and glaze remain vibrant. Rd No. 724275. Vegetable Tureens. Gravy Boat. Hand Painted Pattern and glaze remain vibrant. Incised date of 1928 to base of plate. Serving Plate. - a couple of single lines to Vegetable Tureen lids. Lidded Tureen. Orchard Pattern 1920s. Orchard Pattern 1920s. Gravy Boat. X 2 Lidded Tureens circa 1910. Booths Antique Pheasant Pattern. Fully marked to base with the Booths stamp. The design has swags around a Pheasant and is very typical of early 20th century decoration. Height to top of ferule (for lidded) 130mm. Elegant silicon China dinner set from very early in the 20th Century. Meat Platter:47cm wide;Browning to the porcelain Tureen :age wear and some crackling 23cm wide, 12cm high 7plates: 3 with cracks,3with chips;browning to the porcelain 24cm wide 6 plates:26cm wide;3 with small chips,1 with crack heavy browning to one or two of the plates 3 bowls:25.5cm wide depth of about 2.8cm;2 with small chips 1 lone saucer! Its unprecedented to have an whole antique set together like this. Ive done my best to describe the items and their condition and tried to take photos of all. Feel free to request additional photos or info. Local collection is welcome. Booths Semi Porcelain 'Princess' Pattern Small Veg Tureen, No 183173. Booths Semi Porcelain 'Princess' Pattern Veg Small Tureen, No 183173. Small, chip to the handle of the ladle at the edge, there is no other crazing or fading due to age, or usage. Ideal to fill out your existing collection or to start off a new collection of this beautiful design. Pottery Booths Real Old Willow pattern no. A8025 - Soup tureen & lid XL 31x26x23cm. UK for £12. BULK ORDERS. Booths Semi Porcelain 'Princess' Pattern Large Veg Tureen, No 183173. TWO LOVELY TUREENS IN BLUE AND WHITE. REALLY GOOD CONDITION FOR AGE - WOULD SUIT ANYONE WHO COLLECTS BLUE AND WHITE. 24CM X 9CM (EXC LID) LIDDED TUREEN. THERE IS A SMALL CHIP TO THE TUREEN AS PICTURED. 23CM X 6CM ROUND OPEN SERVING BOWL. IN GOOD CONDITION WITH NO CRACKS, CRAZING, FADING OR RESTORATION WORK. BACKSTAMP BOOTHS SERIAL NUMBER 6181. THERE ARE THREE SMALL FIRING MARKS ON INSIDE WHICH IS COMMON FOR THIS AGE. Item:Vegetable Tureen Lid Only. Pattern:Dragon - Turquoise - Gold Edge. BOOTHS Ltd LIDDED TWIN-HANDLED TUREEN IN WHITE WITH A GOLD AND BLACK PATTERN TO RIMS PATTERN IS FLORAL WITH A TRAILING BUD PATTERN HANDLES ARE BANDED WHITE AND GOLD ON TOP WITH BLACK SPOTS UNDER IS A GOLD LEAF OUTLINE, THE GOLD LEAF OUTLINE IS REPEATED ON LID UNDER THE HANDLE WHICH IS BALL SHAPED WITH BLACK AND GOLD COLOURED SPOTS. BOOTHS Silicon Ware A pair of antique sauce tureens c1900 A very pretty swag and tail design in green and pink Moulded acanthus leaf handles Gilded decoration Condition One tureen is excellent the other has a couple of bits of damage shown in the photos Overall size 8 inches x 4 inches Fast dispatch & securely packed See our excellent feedback!. Item:Vegetable Tureen Base Only. Internal Reference:145162G. Item:Vegetable Tureen Base Only. Pattern:Real Old Willow - No Gold. May include seconds. Product Details. Item:Vegetable Tureen with Lid. Pattern:Dragon - Turquoise - Gold Edge. Item:Vegetable Tureen with Lid. Pattern:Dragon - Turquoise - Gold Edge. May include seconds.